President Marie-Louise Coleiro Preca started saying her goodbyes on Thursday as she delivered her last Republic Day address. Her five-year-term expires in early April and the Constitution makes no provision for a second term. "This is my last speech as President of Malta, on this beloved feast of Republic Day...This has been a privilege, bestowed upon me thanks to the representatives of the people through Parliament, where for the first time the nomination of President of Malta was reached through unanimous agreement, both by Government and Opposition, notwithstanding my coming from the government benches. "I hope this consensus will continue for my successors, because the President of our nation should have no party but should serve the people, with loyalty and with a conscience that goes beyond any desire for popularity," the President said in a ceremony during which she handed out the Republic Day honours at the Palace in Valletta. President Coleiro Preca spent all her adult life in politics, serving as general secretary of the Labour Party and later minister for social welfare before her appointment as head of state. There has been no official word on who her successor will be, with various names being mentioned including Education Minister Evarist Bartolo and former Foreign Minister George Vella. All of Malta's presidents have been former politicians except the first, Sir Anthony Mamo, who was chief justice before becoming Governor-General and then President. 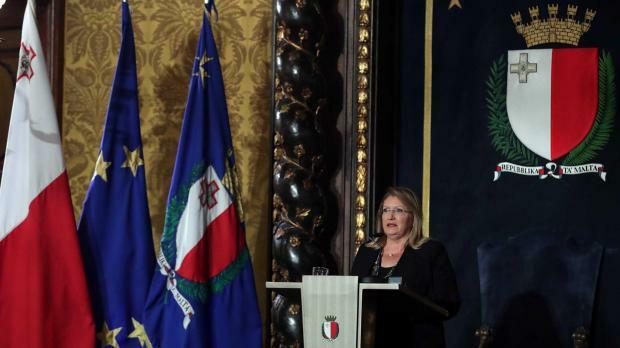 President Coleiro Preca thanked the government and the opposition for having received her criticisms 'with respect' and for having accepted a number of her suggestions. She thanked the workers in the various socio-economic sectors for their service to the country as well as those who create dignified and quality jobs. She praised the business community for taking their corporate social responsibility seriously, for the benefit of Maltese society. "We must strengthen the partnership among workers, professionals, and the business sector, to ensure that our nation creates a dignified and prosperous future for our children," she said. "Above all, I wish to thank the entire people of Malta and Gozo for the respect and support they have given me. "My gratitude also goes to those among us who have criticised me, perhaps at times in haste and with lack of forethought, because I have learnt from the experience," she added. "I learned most keenly about how we are capable and competent in our capacity as individuals, but even more so when we are united, and mindful of one another. Today, more than ever before, I believe that we, as a nation, have the ability to be unique. We have the ability to ensure that nobody is left behind. "We have the ability to strengthen unity, and moreover, to nurture peace among the nations. "Our children want us to be united, and they want Malta to be a country in which nobody is made to suffer or to feel excluded. Our children want us to respect one another. "Our children do not want conflict, rather, they want our country to welcome them and give them peace of mind. "Dear young people of Malta and Gozo, I urge you to be activists for a Malta that is valued for its genuine work, for an inclusive and resilient people. God willing, you will be worthy to become the ethical leaders of our country, in the future. Dear brothers and sisters of Malta and Gozo, I assure you that all the experiences we have lived through together will remain engraved in my heart, with love and tenderness." 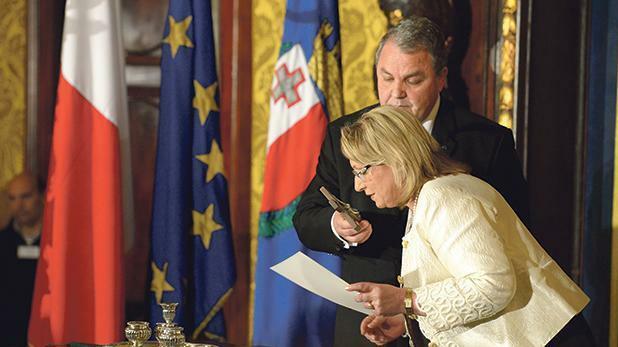 President Coleiro Preca seen at her swearing in on April 4, 2014. "The Declaration of Human Rights is universal, which means that these rights have no borders and are not limited to any nation. For this reason, we must insist that the rights of visitors and newcomers to our islands, including migrants, must be upheld in their fullness, without complacency or favouritism," she said. No economy could celebrate human dignity unless the needs of the most vulnerable were kept at the heart of its operations. For this reason, the vulnerable must receive all the support that they need, she stressed. The social welfare system, therefore, should remain a priority, above and beyond the pursuit of economic advances. On constitutional reform, the President said that this much-anticipated process now appeared to be moving from words to action and a steering committee would be proposing how the process of reform would be conducted. "Let me also take this opportunity to reassure everybody that the process of constitutional reform will be an exercise in participation, for all of the people who wish to be included. Nobody will be excluded, because the Constitution is a legitimate instrument for everybody, and all of our people must feel encouraged to make their contributions, to render our Constitution more relevant in today’s world," she said. She also welcomed the setting up of the Office of the Commissioner for Standards in Public Life. All people in public life should set a good example to the general public, she said. "Without pointing a finger at anybody, I believe that we need to examine our conscience and to ensure that everyone who enters public life understands their responsibility, to offer a genuine service to our people and our country. "The people of Malta deserve to have principled individuals in public life, so that the people and the country will receive genuine services and the highest esteem." In other parts of her address, the President reiterated her appeals for responsibility in the use of social media. "Freedom of expression cannot mean that we say anything, in any way we want. Such freedom brings with it responsibilities, and cannot be abused. We must learn, from a young age, that respect towards one another is the only way for all of us to live in a full democracy, and in peace." She welcomed legislation to give 16-year-olds the vote but said she could not understand how such young people were seen as having the ability to choose their leaders, bud did not have the right to participate in positions of leadership themselves. The President also called for greater respect and better resources for teachers, elimination of the gender pay gap and gender equality. Read the full text of the speech by clicking on the pdf below.